Cat Diseases and Symptoms of Illnesses, Common Cat Health Problems. Treating a Sick Cat. Cat Health Care. Our cats are part of our family. They bring us happiness and laughter. It is especially scary when your cat starts to act sick or depressed. It can be difficult to know what to do for them. This is why having a handy guide that defines some of the more common cat diseases and cat symptoms can be helpful. It is also extremely important to know when to get your cat to a veterinarian for treatment. 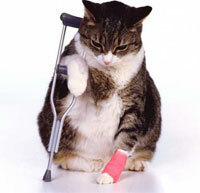 A veterinarian should be consulted immediately for treatment of even the most common cat diseases. Through the following chart you will be able to find the cat disease and the cat symptoms related to that disease. There will be a brief description of what the cat disease is, how it is caused and some preventative steps, if any, to help keep your beloved feline happy and healthy. Each description of cat disease provides information on symptoms, causes, treatment and preventative treatment. Ear Infections: Feline ear infections are often caused by ear mites, fungus, bacteria or a scratch to the ear. These are only some of the common causes for ear infections. Ear Mites: These are parasites that infect a cat’s ears. Ear Mites are highly contagious. Feline Hepatic Lipidosis (feline fatty liver syndrome): This is a common form of liver disease that happens when a cat’s has a loss of appetite which then forces the liver to convert the cats body fat to usable energy. If this process is allowed to continue then fat will build up in the cells of the liver. This disease has an early stage and a late stage which will detail the severity of the disease. Hairballs: This is a major cat illness for cats. It may not seem like something that would be considered serious, but it is. Hairballs happen from a cat grooming his or herself and swallowing hair. Hair is difficult to digest and will eventually get combined with indigestible food which must be brought back up out of the stomach. Feline Diabetes: This cat sickness is just like human diabetes. There are two types of diabetes. The first type, known as type one diabetes, is when the pancreas stops producing enough insulin to process the carbohydrates consumed by the cat. The second type, known as type two diabetes, is when the body’s cells can no longer process the insulin properly. This is one of the most serious cat diseases that are caused when the cat’s pancreas stops producing insulin. 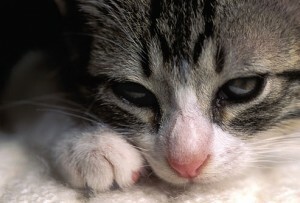 Feline Leukemia: This cat sickness is a retro virus that affects the immune system. It causes frequent infections. This is just one of the cat diseases that also can cause cancer and blood disorders. It is one of the most sever cat disease that kill more cats than almost any other type of cat illness. Feline Leukemia is not contagious to humans or other types of animals. Respiratory Tract Infection (FLU): Just like humans cat can catch the flu. Usually this is transferable through other animals. The cat flue can be caused by several viruses that attack the cat’s respiratory system. The cat flu most often is fatal, especially left untreated. There is a possibility for the cat to survive the cat flu, however, one the cat has contracted the virus it will be a carrier for the rest of his or her life. Urinary tract Infection: This is usually a bacterial infection, but there are also viruses that can cause urinary tract infections as well. The bacteria or virus will attack the cat’s bladder and eventually his or her immune system. These are just a few of the more common cat diseases that can afflict your cat. Although not all cat diseases are fatal it is important to seek treatment as soon as the cat symptoms appear to prevent the problem from getting worse. It is always best to visit your vet whenever you suspect your cat is ill and especially if he or she exhibits any of the above cat symptoms. There are a few major sick cat symptoms to look for that will help you in your decision to take your cat to the vet. Some of these sick cat symptoms include; your cat becomes unresponsive, the cat’s illness last longer than 24-48 hours, cat illness symptoms drastically increase or get worse, your cat is in pain, your cat is having trouble breathing, cat is bleeding tremendously, cat is refusing to drink, cat is refusing to eat for more than 24 hours, cat cannot make a bowl movement or urinate. These are just a few of the cat diseases symptoms to look for. You know your cat’s intimate behavior and habits use common sense and if your senses are telling you to take your cat to the vet then be sure to do so without hesitation. This is just a simple guide of cat diseases and cat symptoms to give you an idea of what cat illnesses and health problems are out there for your cat. This is not meant to replace the professional diagnosis or treatment that only a veterinarian can give. Please remember that the cat diseases can only cause more damage if you try to diagnose or treat the cat yourself. Consulting your vet is always your best option. Most vets will even give your proper care instructions when your bring your cat for their first check up or even just let them know that the cat is new to the family. Most vets will also be more than happy to give you requested care information when asked. However, if you would like to learn more about cat diseases, cat health problems and sick cat symptoms, the internet is a great place to look and learn. There is loads of information out there that will help you keep your best friend healthy and happy for a long and adoring life. Visit our special website that provides lots of information about cat breeds and different types of cats. 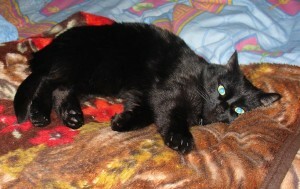 I hope my lovely cat will never be ill! I know one of the common cat disease of British Shorthair Cats – tears from cat’s eyes. Hopefully My cat won’t get ill Too!! I just lost my kitty to thyroid disease & kidney failure. I had her for 15 yrs. Having to learn all over about having a little kitten, again. I gt knowledge from here. yeah. Copyright © 2011-2019 Cat Diseases and Health Problems. All Rights Reserved.